I am very honored to have been accepted for Attleboro Art Museum’s 8 Visions exhibition. An annual group show spotlighting 8 member artists on view Wednesday, August 1 – Thursday, August 30. Since 2002, the museum has presented a late summer “Visions” group exhibition featuring the work of eight member artists. Over 50 artists applied to be considered for this year’s show. Two jurors began reviewing their work in December during the museum’s Members’ Exhibition. The field was narrowed to 20 and two new jurors — Kaveh Mojtabai, founder and publisher of artscope magazine and Hilary Tait Norod, an artist and the director of Galatea Fine Art, a contemporary cooperative art gallery located in the heart of Boston’s SoWA neighborhood in the South End — winnowed the field to the final eight. 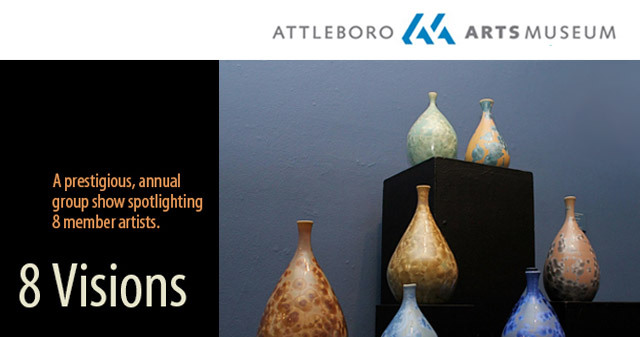 Attleboro Arts Museum: 8 Visions — Thursday, August 30. “8 Visions” artists speak for 5 minutes each about their creative process and working method. Talk and reception are free and open to all.